“Being a high quality food manufacturer, we now have the confidence and comfort knowing that our cooling systems are in the best hands possible.” – Ashley Griss, Yumi’s Foods. 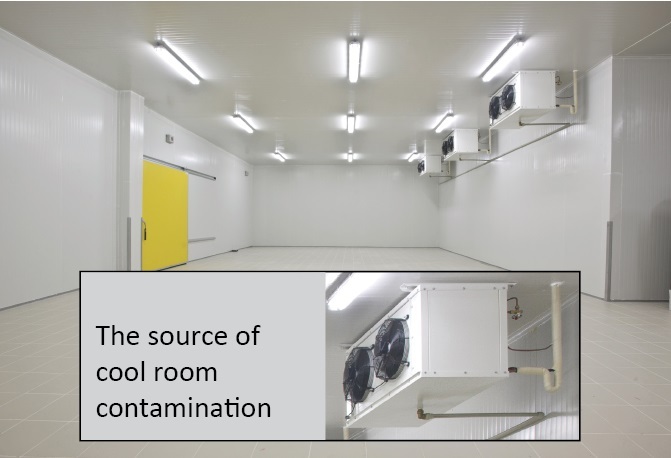 Coolclean provides HACCP certified cleaning and sanitising of cool room assets including fan coil units, evaporators, walls and floors. Are your fan coil units due for a clean? Over time, evaporator coils deteriorate dramatically in performance and hygiene. Inside the units, coil surfaces become contaminated through the build-up of dirt, mould and bacteria. After 5 years, a non-cleaned unit can use up to 50% more electricity. Dirty coils are not only a significant cost to an operator, but can be the cause of food contamination. Coolclean provides specialist cleaning of fan coil units for the food, health and hospitality industry. Our technicians are HACCP certified to work in food related areas. Ensure the cleanest, most efficient operation of you cooling assets. We clean all types of coil-based HVAC equipment, including fan coil units, evaporators, condensers, air handling units, production line equipment, split systems, Thermfresh and Humicool units. Professional cleaning saves energy, enhances food hygiene by controlling the spread of bacteria and mould throughout the room, and reduces unsightly staining of walls. Our technicians are qualified in HACCP food-safe cleaning practices. Dismantling units and cleaning the fan grills, fans, exchange coils and inside and outside of the condenser box. Pre-clean and post-clean mould samples are also taken. Equipment is covered with plastic film to protect surroundings. Clean interior and exterior of FDC unit. Remove fans and motors, clean both sides of fan blades and safety grill. Disconnect and flush drain lines. Clean internal and external surfaces of fan unit. Remove and clean condensation drip tray. Fit a condensate pan tablet to control mould and other contaminants. Clean surfaces surrounding fan unit. A comprehensive service report is provided, together with pre- and post-clean photos. Make your next audit straightforward – we provide a comprehensive report for each cooling unit and each room, together with photos and a Coolclean service sticker. After 5 years, a non-cleaned unit can use up to 50% more electricity. The efficiency of cooling units is affected by a number of factors – the age of the unit, system maintenance and cleanliness can increase energy consumption. In time, the surfaces of coils become dirty as the air moving over the coils can contain dust, dirt, pollen, bacteria, mould, pollen and other contaminants. Mould and bacteria thrive in a moist environment. During the cleaning process, we remove mould, bacteria and contaminants from cooling equipment and surfaces. Following treatment, the unit is protected from mould and bacteria for a minimum of 12 months. The correct cleaning of heat transfer surfaces reduces breakdowns. The majority of breakdowns are due to the system not being cleaned properly. Often the unit is not broken, it is simply dirty. Our own technicians carry specialist equipment to perform work efficiently, to minimise impact on your operation. The cleaning process includes the application of an anti-microbial biocide, which is endorsed by HACCP and CSIRO to effectively remove contaminants. Our technicians are fully trained and HACCP qualified to safely restore unit efficiency in food related areas. Avoiding the use of cleaning chemicals in food related areas makes perfect sense. As part of our standard clean, the food-safe biocide is environmentally friendly, pH neutral, non-corrosive and fully biodegradable. We clean and sanitise all brands including Kirby, Eco, LU-VE, Frigel, Gunter, Muller, Actrol, Buffalo Trident, Cabero, Bitzer, Tecumseh, Copeland and Embraco. We also clean walls, ceilings and food related equipment on request. Food products must be stored at the correct temperature in order to ensure food safety. By cleaning coils and surfaces (together with 12 months’ added protection), the Coolclean service restores units to ‘as new’ efficiency, where performance improvements see the correct airflow and temperature maintained. Performance validated by HACCP and CSIRO, we use a food-safe anti-microbial biocide to break down and digest contaminants, protecting units from mould and bacteria re-growth for 12 months. Mould and bacteria thrive in a moist environment. This builds up naturally on cooling units, walls and ceilings. Cooling units act as prime incubators to spread mould and bacteria throughout a cool room. While some moulds are desirable in foods such as blue cheese, other moulds and bacteria can produce contaminants that degrade food, cause illness and reduce shelf life. It is well known that contamination is a leading cause of food damage. Dirty fan coil units and evaporators act as the primary source of contamination in cool rooms. 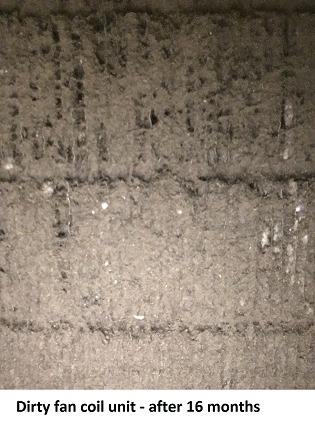 When cooling units are overdue to be cleaned, coils are typically chocked with dirt and bacteria. As a result, the fan spreads contaminants throughout the room and stains the ceiling. In order to break the cycle, cleaning and disinfection of cooling units is required. Coolclean provides 12 months’ protection from mould and bacteria, to assist in keeping cool rooms hygienically clean and suitable for food storage. Coolclean provides cleaning and disinfection services throughout Victoria, including Melbourne CBD, Dandenong, Braeside, Berwick, Hallam, Tullamarine, Brooklyn, Laverton, Sunshine, Port Melbourne and Airport West. Ensure the cleanest, most efficient operation of your cooling assets. Contact us to discuss your requirements.